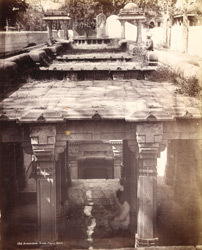 Photograph from the entrance platform of Dada Harir's Well at Ahmadabad in Gujarat, taken by Henry Cousens in the 1880s, from the Archaeological Survey of India. The vav, also known as a step-well or baoli, was a common features of towns in Gujarat. An inscription within one of the step-well’s galleries states this structure was constructed by Bai Sri Harira in 1501, a lady belonging to the court of Sultan Mahmud Begarha (r.1458-1511). The actual water reservoir is encased in a decorative building that is approached via a domed pavilion and descended to via two central spiral stairways. The interior of the well has four levels of pillared galleries which would have been used as resting spaces, leading to the underground octagonal well. There are inscriptions in Sanskrit and Arabic carved on the well.